Would this threat, this fear, be enough to keep Littleton silent? Suffice it to say, he hasn't proved himself, in subsequent conduct, to be either the brightest or most moralistic person ever. This scenario would explain much of Littleton's subsequent problems, as well as why he is holding back. This scenario would also explain a lot about Tommy's subsequent behavior--particularly why he has been so shaken up since his recent interviews with Sutton Associates. We have made him believe we think he did this. As he said, "In my heart, I know I did not do this." What does that mean? Could it mean that he knows he did not actually kill Martha, but still feels guilty because he knows that if he had never fooled around with Martha, none of this would have ever happened? He protected his brother, but now he's getting more than he bargained for. He wanted to feel some redemption for his participation, so he confessed to what, in his mind, was the worst thing he did with regards to the death of Martha: he had a sexual encounter with her. In Tommy's mind, he has confessed to his part of the crime, but is still being hunted (as well as haunted). Now, he realizes he is on the verge of taking the full fall for Michael--and it frightens him. He knows Michael did this, but probably still thinks of the incident, on some level, as one big accident. Michael didn't mean to kill her. He just got out of his head. Michael probably looks at the murder in much the same way. He may have been in such a state of psychosis, the act of killing Martha felt completely removed from himself. It was her fault, after all. In some sense, Michael has probably started to believe that he is not responsible. It was taken care of for him--just as Sheridan took care of his drunk driving incident, and whatever else he fucks up. Michael has largely escaped scrutiny. Until now, no one has really looked closely and pieced the holes together. So why does Michael then [^] us about masturbating in a tree outside her window? Two reasons: 1) he knows that there are ear-witnesses, like Julie and John, who have testified they heard someone going in and out of the house around that time. (The time when, presumably, he, Tommy, and whoever else, were cleaning up the crime scene, etc.) This way, he ties up that loose end. And 2) his account of going to her house and calling her name "proves" that he didn't know she was dead, and thus couldn't have murdered her. Michael mentions watching the naked woman, and his masturbating in the tree, because this gives him a motive for what, on the surface, is a very curious action: leaving his house in the middle of the night and ending up outside Martha's window. He even adds something about "sensing the presence" of someone near where Martha's body was found. Michael is actively deflecting any possible suspicion of guilt. 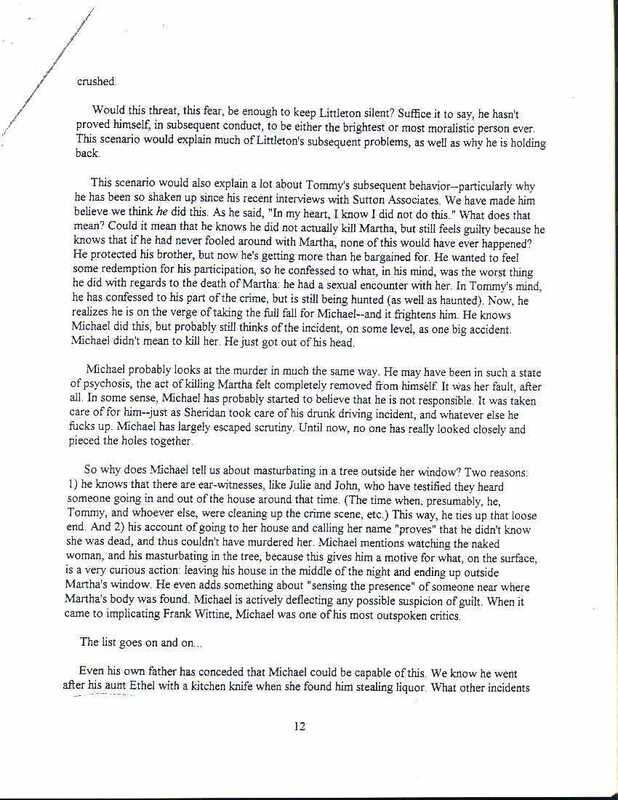 When it came to implicating Frank Wittine, Michael was one of his most outspoken critics.